Now a "New York Times" bestselling series, "Even in beautiful Vermont, Archer Mayor finds shadows . . . and his detective, Joe Gunther, finds a way to beat them back." "NPR"
Joe Gunther and his team at the Vermont Bureau of Investigation are alerted to a string of unrelated burglaries across Vermont. Someone, in addition to flatscreens, computers, and stereos, has also been stealing antiques and jewelry. Meanwhile, in Boston, an elderly woman surprises some thieves in her Beacon Hill home and is viciously murdered. The Boston police find that not only is the loot similar to what's being stolen in Vermont, but it may have the same destination. Word is out that someone powerful is purchasing these particular kinds of items in the "Paradise City" of Northampton, Mass. Gunther, the Boston Police, and the vengeful granddaughter of the murdered old lady convene on Northampton, eager to get to the bottom of the mystery and find the "responsible parties" although each is motivated to mete out some very different penalties. 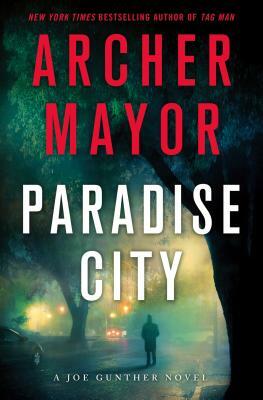 ARCHER MAYOR is a death investigator, a sheriff's deputy, and a volunteer firefighter and EMT in addition to being a best-selling novelist. He lives in Newfane, Vermont. "Understated, occasionally very funny (see Kunkle) and very intelligent. In his 23rd appearance ... the Sage of Brattleboro remains as appealing as ever." --Kirkus Reviews "First-rate procedural series."